Lisa came to CHS after a viral infection left her with hearing loss in one ear and Tinnitus. The aftermath of the sudden change left Lisa on a Long-Term Disability. She was struggling to cope with diminished hearing capacity and constant loud ringing in her ear. Lisa decided to make use of some of the CHS programs and services to help her get her back to work. 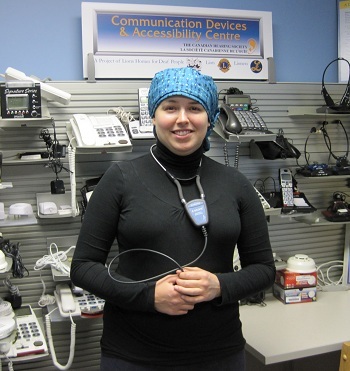 The Canadian Hearing Society's Employment Services Program (ES) assisted with hearing aids, custom ear plugs to minimize loud work noises, an amplified stethoscope and a device to help with her Tinnitus. In addition, a Workplace Accommodation Assessment was done to help provide direction and assistance with her return to work. Lisa has been an ES client for close to 1.5 years and returned to work 1 year ago. With some employment counseling support she has re-gained her confidence and is enjoying workplace success.